President Obama said the United States would “work with a broad coalition to dismantle this network of death,” referring to the Islamic State. “Those who have joined ISIL should leave the battlefield while they can,” Mr. Obama said in a blunt declaration of his intentions. 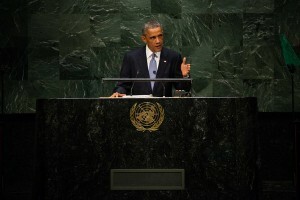 “The brutality of terrorists in Syria and Iraq forces us to look into the heart of darkness,” Mr. Obama said. The military campaign against the Islamic State, Mr. Obama said, was only the most urgent of a raft of global challenges in which the United States had no choice but to play a leadership role: from resisting Russia’s aggression against Ukraine to coordinating a response to the Ebola outbreak in West Africa; from brokering a new unity government in Afghanistan to marshaling a new push to confront climate change. Mr. Obama delivered a searing critique of Russia’s incursions into Ukraine and promised to impose a rising cost on the government of President Vladimir V. Putin for what he called its aggression. He was particularly critical in describing the downing of a Malaysian commercial airliner over eastern Ukraine in July by what the United States and its allies have said was a Russian-made missile system, and he denounced the subsequent efforts to block recovery teams to investigate. All 298 people aboard were killed. Mr. Obama also said the United States would train and equip moderate opposition forces in Syria to counter the government of President Bashar al-Assad, and he repeated calls for a political settlement to end a civil war that has killed more than 200,000 people. It was a starkly different president than the one who addressed skeptical world leaders at the General Assembly last year, weeks after calling off a threatened missile strike on Syria over the use of chemical weapons. Mr. Obama spoke with the urgency of a wartime president, seeking to rally allies for what he said would be a momentous struggle against the forces of Islamic extremism in the Middle East. Still, it remained unclear whether Mr. Obama’s speech represented a fundamental reconsideration of his policy or a reluctant response to the threat posed by the Islamic State, which took on emotional resonance for the American public after the militants posted videos of American hostages who were beheaded. Mr. Obama made clear that the United States would act only if surrounded by a broad coalition. He dwelled on his success in signing up five Arab nations to take part in the airstrikes against Islamic State targets in Syria, casting it as a historic moment in which the Sunni Arab world was united to fight the scourge of Sunni extremism. In an echo of his speech to the Islamic world in 2009, Mr. Obama addressed young Muslims directly, appealing to them to resist the blandishments of violent jihadism. Foreign fighters are one of the most immediate threats from the rise of the Islamic State. While Mr. Obama emphasized the new threat from the Islamic State, he also touched on the Israeli-Palestinian peace process, which has flagged badly, despite the energetic diplomacy of Secretary of State John Kerry. The 50-day war in Gaza this summer hardened the differences even further. The president, as he has in previous speeches to this international audience, acknowledged that the United States is wrestling with own demons of racial and ethnic tensions. “In a summer marked by instability in the Middle East and Eastern Europe, I know the world also took notice of the small American city of Ferguson, Missouri – where a young man was killed, and a community was divided,” he said. To some extent, Mr. Obama’s remarks seemed designed to get past months in which the president appeared openly conflicted about the proper use of American military force in the Middle East – an ambivalence that opened him to criticisms of being irresolute. The speech was the centerpiece of a hectic three days of diplomacy for Mr. Obama, who met on Tuesday with the five Arab leaders to thank them for supporting the Syria operation. Later Wednesday, he was scheduled to lead a Security Council meeting where he would be seeking approval of counterterrorism resolution. He also was planning to meet with Iraq’s new prime minister, Haider al-Abadi, and with Prime Minister David Cameron of Britain whom American officials hope will make fresh commitments to the military campaign.